Sky Bear Games – We play games. We make games. Four days left on our first Kickstarter! Warning: The following contains detailed spoilers for the final dungeon of the Tomb of Annihilation. Obviously. Note: For brevity’s sake, I don’t say every time I check for traps, search for secret doors or use detect magic. Just assume stuff like that happens in every damn room! 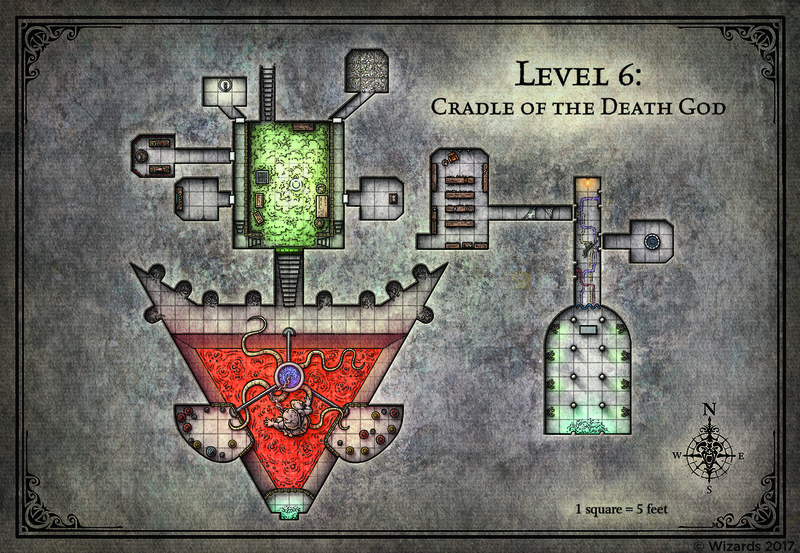 Heading down the stairs to the final level, we saw the green glow from a smouldering cauldron in the centre of a dungeon room. There were three empty rocking chairs, haberdashery lying around and a spinning wheel. There was a caged prisoner in the middle of the room, and three little dolls made of various bits and pieces limped up to us. They warned us that the Sewn Sisters would come, and they asked us to free them. We said we would. Gathering the miserable looking things up, we moved into the room properly. That was when the caged prisoner turned around and I got the shock of my life. It was me. I yelled out that I wasn’t going to be so easily spooked. But as we got to talking, she revealed to us what she was: a clone, created by the Sewn Sisters, and used to spy on our progress. Nanny Pupu, all that long time ago, had taken some hairs from me and sent them away to the Sisters, before we killed her. We freed and dressed my clone, and took her to be with our small band of refugees. Then we settled into breaking the puzzle of the room we were in. At the end was a door that had five plaques on it: one triangular, one a square, a pentagon, a hexagon, and finally an octagon. Behind each of these would be a keyhole corresponding to the skeleton keys we had liberated. But to move the plaques, we had to solve the puzzle in each of the five rooms on the mezzanine level above us. So we started with the room with a triangle on the door. This one did not take us too long. There was a lever, but it was behind a glass cylinder which we couldn’t lift or move. Zagmira used a misty step spell to get in and out of there. The first keyhole was revealed. In the next room, the square-plaqued door, we found pages of spells flying around. We were able to grab three spells: Alarm, Immolation, Unseen Servant, and Investiture of Ice, before the rest turned into a whirwind of dust mephits. One we dispatched that, we had to figure out how to touch the level, which was in an ethereal state. It took us ages, trying all sorts of methods, but finally Orvex thought to just try drawing a square around it. And that worked. In the next room, the pentagon room, a gaunt man setting up a feast invited us to eat. Ignoring him, we inspected the tapestries around the walls. One patch was different from the others. It had a devil face, a motif common in the room, but the mouth was real. I had a skeleton poke its finger in, and that solved the puzzle. Unfortunately, we left the room without eating, which made the man lay a curse on us. We decided to rest up, and return once Hugo had asked the chwingas for a spell to remove the curse from all of us. We wasted an entire day just removing the curse, and were finally ready to go again. The Sewn Sisters had not yet emerged, so we went to the hexagon room next. Within was a cracked six-sided mirror with the words ‘Piggy piggy piggy’ written above it, and five candles. I got the team to search for the sixth candle, and we found it, lit them, and then said piggy three times. A lever appeared in the mirror, and we pulled it (a bit weird, seeing oneself holding something that wasn’t actually there). Then it was onto the final room. This one was where it nearly all went wrong. There was a leather tome upon a lectern with a rhyme written in infernal, and eight skeletons along the walls. We read the rhyme in our heads, front to back, and back to front, and were trying to decide which way it should be said aloud. Hugo, Flask and I were the only ones in the room when I accidentally triggered the trap while exploring the room. The gravity went upside down, the ceiling opened up, and beneath us was a giant metal blender. I cast Fly on Hugo and myself while Flask clung for dear life onto the lectern. We read the rhyme quickly, and the trap reset, and the lever appeared. Outside, the rest of the team were standing there, watching the approach of the Sewn Sisters. I was fed up, not keen on talking, so we quickly dispatched them, focussing on the closest of the witches first so as to break their coven and diminish their spell power. With that done, the other two were easy to take down. The three little dolls were now inert, and free I suppose. And the five keyholes were now revealed. We decided to have one last rest before confronting Acererak. We placed the keys in the door and unlocked it to reveal a huge chamber with lava beneath us. We were able to safely assemble on a wide ledge near the door, while Acererak was on another ledge to the right of us, and the Soulmonger hung suspended in the air by metal cables to the left of us. Some… thing… was attached to the Soulmonger, tube in mouth. It looked like it was made of different bits and pieces of different people. Acererak started to speak to us. It was standard bad guy monologue, but Orvex whispered to me to keep him talking as long as possible, and then he whispered something long and complicated to Hugo. Meanwhile the rest of us tried to hide them, keeping Acererak going on and on about how he was using the Soulmonger to build a new god, a vessel for some being called Tenebrus, his master. Alas, we couldn’t keep him talking forever, and the fighting began. He made a sphere of annihilation and sent it amongst us. It focussed on Zagmira, and she ran around the ledge jumping and cursing as bits and pieces of her voluminous robes got singed off into oblivion. Flask ran dashingly up the cables, all the way over to stab Acererak… and got killed in by single spell of Acererak’s, his corpse sent flying back to us with the impact. If that wasn’t shocking enough, my skeletons and zombies refused to attack Acererak! Hugo ran between us all, shouting to give him the Nine Gods, so we started doing so, and the more nimble and ranged amongst us started attacking the god-golem in the centre. It opened its eyes, and hit us with some sort of whammy that exhausted us all. Zagmira was finally overcome by the sphere of annihilation, and a second corpse lay on our side now. We ignored Acererak, who seemed untouchable, and continued to stab and shoot the god-golem, until finally Ninya hit it, killed it, and leapt off it before it became insubstantial. Acererak was cursing us, but saying it would only delay him a little. Thankfully, he had been distracted enough by the flurry of the rest of us, to fail to notice that Hugo now had all the Nine Gods’ holy objects, and was starting to glow. Chwingas started to appear around the cavern. Acererak pointed a bony finger at Hugo, and annihilated him with another single kill spell. Hugo died, but in that moment the Soulmonger exploded, and a giant laser shot for the sky from its heart, through all six levels of the tomb above. The laser resolved itself into a figure… a giant figure of a man… but was it Hugo? Or was it, as a celebrating Orvex cried out, the Nine Gods reconstituted into the original god, the one that ‘vanished’ before they appeared… Ubtao? Acererak was mad now. All the power of the Soulmonger was wasted now, not given to Tenebrus, but instead to Hugo/Ubtao. Not only that, but Flask and Zagmira stood up, and all of us were refreshed by wave after wave of energy from the giant glowing figure above us. So we naturally attacked. It was still a hard fight, even with Hugo sending us energy and healing, but we managed to wear Acererak’s spell power down, and our tabaxi attacked with unrelenting energy even after Zagmira and I were well out of spell power ourselves. Above us, Hug-tao was growing, expanding his consciousness, testing his powers. Ninya became Acererak’s focus, as she was dealing him the most damage, and he managed to knock her down. But when we got her back up again, she finally managed to kick the stupid skull of his neck vertebrae, into the lava below. My oldest friend, once Hugo, now Ubtao, but maybe still Hugo, wished us luck, and left. There was no corpse, so… maybe it was Hugo? Either way, the waters of Omu were starting to fill the dungeon so we decided to destroy what we could, save what was needed, and leave as soon as possible. We found, in the same cavern as us, a ton of phylacteries of the servants of Acererak, so we threw these in the lava. Further back in the cavern we found a teleporter that took us to Acererak’s private chambers. In his chapel of hate, we found some nothiks chained up, a font for the baptism of the new god, and an unconscious man in a body bag. We picked him up and kept exploring. There were many strange things, like a portal to Arcadia, a pool of black ooze, a music box that could sound like many instruments (I took that), and a library full of arcane texts, looked after by a man named Mr Fox. We tried to get him to escape with us, but he said he was bound here. Zagmira said she was staying too. When we said she had to escape before the tomb became a lake, she said it was fine, she’d go to Arcadia instead, and besides, she needed some other prize now that the Soulmonger had exploded. But we still had to get out before it was too late, so we fled the chapel of hate, out the teleporter, across the quickly cooling lake of lava and water, and through the tomb which was now a wonderland of waterfalls. I noticed, as we escaped, that the Starfallen had set free as part of the destruction of the works of Acererak, but Nepartak, the princess in the skull, was still with Copper Bell. That was confusing. Shouldn’t Acererak’s death have freed her? Of course we hadn’t killed him completely… he’d have many phylacteries in other places… but we’d ended the horrid spell on our plane, and that’s why we came here. When we emerged in Omu, Mwaxanare received us happily. We gave her the chalice of Chigakare, and told her of the return of Ubtao. The yuan-ti had been purged completely from Omu. We travelled with her back to Port Nyanzaru, where she announced the return of the Omuan monarchy and of Ubtao. Later that first day, the man we carried out of Acererak’s chapel came to. He said his name was Volo, and he was very thankful to us. He seemed a little put out when none of us recognised his name. As we travelled he regaled us with many tales of his adventures. On our way up the river-routes, we passed Camp Vengeance, only to find it in ruins. There seemed to be a colony of were-tigers living there now. Some on the bank shouted to us to leave them alone, unless we wanted to convert to were-tigers and join their free love colony. I recognised them as they spoke to us… it was Cipactonal and Oxomoco. Well, at least they seem happy. And they destroyed that abysmal self-righteous camp. Win-win. My master Syndra was pleased to see me, and seemed to be at peace with the fate of Hugo. She said I seemed to be glowing. I couldn’t really see it myself. She invited me to come back with her to Waterdeep, but I told her I had promises I made here that needed fulfilling first. Besides… I don’t think I can go back to being servant to a master again. I’ve learnt too much on this adventure. It was time for the band to go their separate ways. For River and Flask, this happened quicker than I could think. River only had time to say a quick goodbye to me, carrying an unconscious Flask over her shoulder, one week into our stay in Port Nyanzaru. Flask, bored back in town, had gotten in trouble with a merchant prince, and so she had arranged for them to get passage out of town on the first boat out. She refused to wait for me to organise something else for her, but I did at least see them safe on their ship, and I did manage to create a diversion on the docks so they got away safely. Who knows where they’ll end up? But they are so much more powerful now than when I first hired them. I’m sure they’ll be fine, wherever they end up. Orvex chose to return to Omu with Mwaxanare. He couldn’t resist a chance to study aarakocra culture up close. She’s hiring him as an advisor, and paying in antiques! I can’t think of a happier place for him to be. Copper Bell has held onto the skull of Nepartak and continues to communicate with her still. Nepartak has asked for her to find her ancestor, Zalkore, a former queen of Omu who may still be alive due to a curse. They think she might be able to help restore Nepartak to a living body. It’s believed she is in Nangalore, yet another ruined jungle city. So Copper Bell is off on another adventure, but she seems a lot happier and full of purpose now that she has a child to care for again. Ninya went back to Waterdeep with Syndra, thanking me for my help. I asked if she wouldn’t stay and adventure further with me, but she said she had to get back to her best friend and make sure she was still alive. There are people who helped us who we may never see again, and some who I know we won’t. Eeyal and Inete seem like distant memories. Theeka’s loss is a little fresher, and I even still have her murderer’s corpse in my skeleton army (his bones always seemed to hold some memory of his excellent marksmanship). Those three I know are dead and gone, and because of the Soulmonger there was nothing I could do. Except, I hope, maybe their souls were freed when Hugo became Ubtao. I wish I’d thought to ask him. I feel like Artus and Dragonbait may have made it out though. I have no real evidence to base this on, except the fact that the frost giants haven’t turned the whole world into one big snowball. I’ll have to see if I can research a spell to contact them and see. But that will have to wait for my other promises first. So! That’s finally it for Tomb of Annihilation! Wow. Let me know if you want more of an in-depth analysis of this campaign (or any others) from James’s perspective as a DM. I’ve been trying to encourage him to write or vlog about it, as he’s very experienced and thinks a lot about what he chooses to play or not. He’ll have a much more in depth analysis, if you’re interested in hearing that. What are the impacts for the meta-plot of our meta-campaign? Well, as you might have seen if you followed the whole campaign, TOA tied into our SKT playthrough with the presence of Artus Cimber and the ring of winter, and obviously the presence of Ninya, who was there to save Genora’s (second) life! But it did also tie into the Dirwin mega-campaign, with the mention of Tenebrus. This is very much James’s invention here, so don’t get confused. He rewrote parts of the ending of TOA, particularly the part with Hugo turning into Ubtao, but also with Acererak’s god-golem being intended for possession by Tenebrus. (Basically he likes to see me scream when things tie into the meta-plot, haha). Also with the Mechanus scene happening on level five of the tomb, that directly ties into what Dirwin is doing right now with the March of the Modrons. So this does complicate things if you’re trying to make our campaign stick to the popularised timeline of events in standard Forgotten Realms… but basically, don’t worry about it. Return for a brief adventure with Genora/Serissa, who, having recovered from the soulmonger curse, has to now defend her throne from those who think her weak, and protect against mortality by… getting married and producing an heir?! Or start anew (but still part of the meta-plot) with a young tiefling girl in Waterdeep, and her plucky gang of friends, as we play through the very exciting looking campaign Dragon Heist? Looking down into the next level, we saw a pentagonal room full of stinking plants. There were exits at two of the corners. 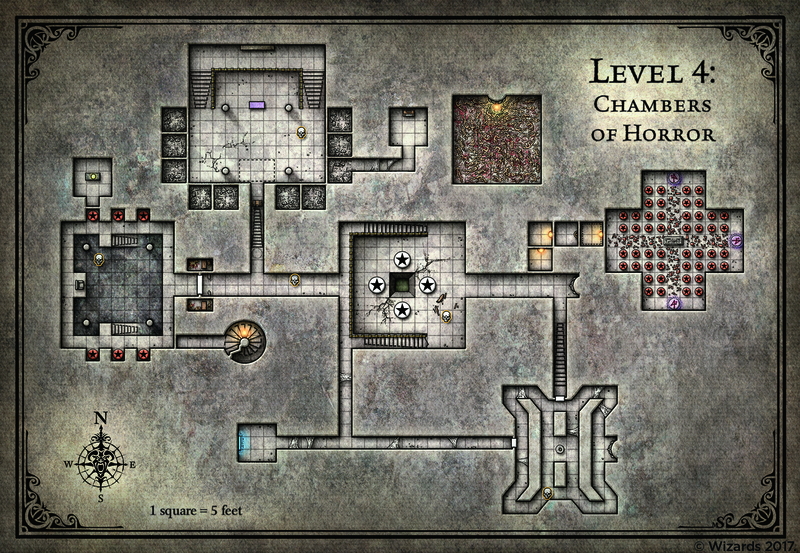 I recognised this as the room I had seen when I hijacked into the eyeballs of a tomb guardian from the scrying pool. We decided to take Withers’ secret staircase down instead, and this was finally the end of that. There was a door off of it, leading to a small landing on an underground lake. There were some boats ahead of us, and further ahead, not just the walls of the one pentagonal room, but a few others of the same shape, and each of these were mounted on giant cogs. We figured there must be a way to rotate the rooms to open up new exits. Oz flew around and mapped out the giant cog rooms. We left the lake for now and walked into a large corridor. On the wall were the following words in blood: Awaken Napaka. We considered whether this could have something to do with the mace we had. The corridor was large and sloping down towards a drape. We got a feeling, from the design of the corridor, that something might come out of the uphill part and roll down towards us. We backed out of the corridor and got Oz to check the drape for us. Opening it up, he found a four armed gargoyle statue, though one arm was broken off. It had the inscription “Three I need, then three more, then three more still to open the door.” Not keen to give up the nine gods just yet (or at least that was our assumption), we decided to come back later. We made our way across the bridge from that corridor to the plant room we had seen from above. We looked into the next cog room, to the west. It had an acidic smell and grey slimy puddles. There were friezes of dragons on the walls with nozzles in them. But when we sent skeletons in and triggered the trap, we realised the acid trap had actually run out of acid! So we were able to cross into the next room. It was quite small, so for the time we just sent Oz in. There was an iron lectern with a control panel, and a puzzle on the wall. There was also another skeleton with a key head, and once we killed it we got the hexagonal key. Oz considered the puzzle and the control panel more, and we realised it was the control panel for the giant cogs, and the puzzle was a sort of map. We backed out into the plant room, the greatest extent of my psychic reach to Oz, and got him to test the panel. This is where things started to go very, very wrong. Oz got something wrong and the room he was in started filling with green goo. At least he was flying… but then he touched another wrong button. The door slammed shut on the room. Then, through the psychic link, Oz and I were both paralysed by a voice in our heads. Something called Gora. It thought we were Acererak, but once it realised we weren’t, it took control of my mind. I ordered everyone to follow me down into the boats, and they followed! Then, when we were out in the middle of the lake, Gora the aboleth attacked! I was still under its control, but it didn’t realise we had so many allies with us. Ninya, as much as she hated touching it and being out in the middle of the water, was the one who managed to slay the hideous beast. My mind was freed. But for a moment there we were nearly very, very dead. We went back up to the plant room, and Oz was no longer panicking: it seemed like the green goo had run out, and he was still able to work the control panel without touching the goo. So he figured out the rest of the puzzle, and the room we were in began to turn. At this, the shambling mounds made of plant matter in the room with us attacked. We had a misstep while fighting them at first – lightning attacks healed them! – but we were able to weed them all out. We noticed a small room at the northern end of the room, with a small cloud of gas billowing out and up. I sent a skeleton in, and it found the corpse of Lord Brixton, the final member of the Yellow Banners. The room was only a trap room. We were able to salvage from the ill-fated adventurer his backpack, some gems, and his draconic longsword. We headed to the next pentagon room. On each wall was a wardrobe with different carvings on it, and a portcullis to the north that had five blood-drop shaped gems above it. We opened the first wardrobe, and an orc warband piled out from what looked like the plane of Acheron beyond. Once we defeated them, not only did the first of the blood-drop gems glow sanguine red, but I was able to replenish my zombie supply with orc zombies. In the next wardrobe was a portal to Gehenna, out of which flew four nasty Mezoloths. But we still overcame them, despite the horrible cloudkill spell they kept dropping on us. The next wardrobe, decorated with ornate clockwork, opened up into Mechanus and expelled a single monodrone. We didn’t want to kill the poor thing, so we decided to take a break from this puzzle, and see what other doors we could open around this cog. There was a passage to the south, but I couldn’t follow, due to needing to hold onto the link with Oz, and my undead army could not follow into the much narrower passage. So the others went in. Within they found a semi-circular chamber with a life-sized golden statue of a mastodon on a stone cog, with jewelled tusks. The murals on the wall told us what we already knew: this was the tomb of Chigakare, which Mwaxanare had asked us to find, and fetch his chalice. We knew it would start a fight though, if we figured out what the puzzle was. Orvex was the one to spot it: there was a star-shaped indentation on the mastodon’s head. And where was a star-shaped key? Oz was looking right at one, the head of a lever on the control panel. So after a rest, with some maneuvering, we got the star lever over to that group. Given that it seemed likely, with the evocation magic on the floor, that the floor would become lava, we could only fit six people in the room riding the masotodon, so Fionn and Zagmira left and came back to me. And then Orvex stuck the star key in. I hear the fight was very hard. Yes, the floor was on fire. The mastodon started rotating, so Hugo and Orvex had to cling on for dear life (the tabaxis were all fine though). Wave after wave of devils came to attack, but the six within the room were able to defeat them all, and gain the chalice of Chigakare. That led us back to our same old problem of the blood-drop gems and the monodrone. But Fionn had an idea. I gave her my magic pigments, and she painted the last three rubies. Unfortunately we were only able to trick the middle ruby, but that meant we didn’t have to kill the monodrone, so that was a success. We did still have to fight the last two wardrobes: bone demons from the Nine Hells, and will o’ wisps from the Shadowfell. 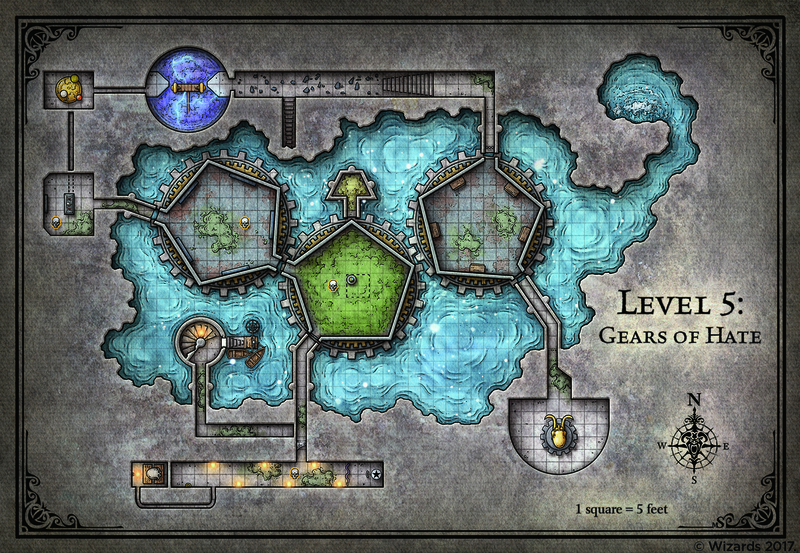 We were finally able to advance north, and found ourselves out of the cog rooms and in the caverns again. We came to a room that had scraps of metal and tarnished coins, so we went an orc zombie in to test the room. All of his organic armour – the leather, mainly – decayed away. There was a ring radiating necrotic magic out at the end of the room, and as soon as he touched it, it disintegrated. That made the magic effect stop, and we were able to advance. The tabaxis and Oz were able to safely scout ahead, and they found an orrery. There were more continents on the representation of Faerun that we were aware of… There was also a nycaloth hiding inside a model of a moon, which they fought fairly quickly. Zagmira flew over to check out the orrery, and managed to unlock a secret hidden effect: we were all healed a small amount. We decided to go back and figure out the corridor with the four-armed gargoyle before going down to the final level. We finally noticed a new detail: one of the wall murals had a croc-headed man carrying a chest… and the lock on the chest was real! We had a jade croc key from upstairs, so we tried that, and it worked, revealing a crawlspace. Oz went inside, and found a small hidden room with a strange massive green thing on wheels. Also there was a large red gem. Oz picked it up, and had to flee back into the crawlspace as the massive green thing started to wheel towards him and slam into the wall! He saw the writing on the side… Napaka II! He tried to fly out the crawlspace back to us, but that made Napaka crash out of the wall towards the gargoyle. It kept trying to go for where Oz was in the wall, so we had to think quickly. Flask remembered that we had a mace that was supposed to destroy Napaka, so we lined him up to bat at the wheeled thing as it came by, and ordered Oz to fly out. As he did, Flask whacked the machine, and it disintegrated completely. A lucky guess! Finally, calm again, we were able to identify the gem as the Eye of Zeltec, another one of the famed treasures of the Tomb. Our Prince of Cats kickstarter has managed to reach its first stretch goal! I’m really excited to be able to bring you ten new images (plus one freebie to celebrate) which will decorate the end of each unique storyline in the game and be unlockable in the main menu gallery as game collectibles. You can check out more, including exclusive hints to unlock certain plot lines, on our latest Kickstarter update. As we went down to the fourth floor, we could see the ground below, with a trap door set between some statues. Bone dust and stray bones lay everywhere. We found the plaque for this floor, and it said: Death to fire, dine or drown, precious air, falling sand; The army sleeps in silence; The mirror holds twelve; Find the iron sceptre’s twin; The maze holds the key. We backtracked to the secret staff corridor to see what was hidden that way. That way, we found a vaulted chamber. On the other side of the room from us was a throne of bone and skin, with an iron sceptre sitting on top of it. In a pit below us, three undead with all their eyes and mouths sewn shut were painting the walls with events that had happened. We spotted what we thought was Lord Brixton of the Yellow Banners on the mural, dying in some form of poison trap. Heading out of there through the next door, we triggered the trap that we could have disabled if we had gone the other way, which was two secret doors opening and disgorging a few ghasts. Since they were now between us and the pit, we thought we had a clever idea, and we used turn undead to make the ghasts run into the pit. Then we fireballed the pit. That turned out to be a mistake, and at the incineration of the three painters, a zombie dinosaur rose from the dirt of the pit. It was hard to fight with it eating my zombies and seeing them slide back out of its holey stomach, but we made it. One of my remaining zombies carried out the iron sceptre from the throne, and nothing happened when it picked it up. Further down the corridor, before it met up again with the central chamber, another corridor split off to the north. Within was a dark chamber. There was a chest in the middle of the corridor, which we opened. As soon as we did, a boulder dropped behind us and started rolling down at us. Hugo quickly cast Wind Wall to slow it down, and Fionn cast a reduction spell. With the boulder diminished, we were able to roll it up the corridor again and down into the pit with all the zombie corpses. Coming back, we found an invisible key inside the chest. Heading into the chamber, my zombies triggered the second half of the trap: a pit just in front of the door. We took in the large chamber beyond while Fionn crafted a bridge over the pit from large scraps of metal from the forge. Before us was another tomb, a crystal sarcophagus within, constantly changing colours. On the wall facing us was a huge painted maze. Going over Fionn’s bridge, we climbed the stairs to the balcony to reach the maze painting, walking past painted minotaur guards. While Orvex and I started to copy down the maze, Flask touched it, and vanished. Ten minotaur guards suddenly popped out of the walls from secret doors. After dispatching them, we decided to try and get in the maze and help Flask. It turned out to be a foolhardy idea: we were all separated, and my undead army were not able to follow us in. Instead, I could see them above me, giant, with the rest of the room behind them. I ordered them to assign themselves each to a different one of us, and try to guide us out of the maze, since we could see them pointing. However, the maze shifted around me, and the others, stopping the zombies’ simple intellects from being able to help us. Later, when we were all safely out, I was able to get the following information from the others. Fionn saw the skeletal remains of a child, and then ran into a minotaur. She attacked, but overwhelmed, decided to try the jumping spell to get out. It actually worked! Flask found a purple crystal key, and by taking it, vanished from the maze and returned to the big room. Copper Bell found a red crystal key and the same thing happened to her. Orvex found a gold key and the same happened to him. As for me, meanwhile, I saw a figure ahead of me down the hedge corridor. It was Zagmira! Turns out she was the last of the red wizard party, and she was trapped in here too. Minotaurs started to come towards us, and the others outside the maze told the zombies to try squishing them with their fingers. It actually worked! So they tried something else: letting us climb out on the zombies’ fingers. That worked too. It was a great relief to be out of there. We turned to the sarcophagus and watched its changing colours. As soon as it turned gold, Orvex thrust his gold key in and unlocked it. It was full of salt, but when we dug in the salt we found jewelled bracelets, and a cloak of scintillating colours. Zagmira took and wore this, and was filled with the spirit of Unkh. We took a short break to gather ourselves, and Zagmira told me she wanted to help destroy the Soulmonger, so long as she could keep the pieces of it in the end. I said yes, thinking it would still be bad to start conflict with a member of the Red Wizards, but in my heart I hoped I’d have the opportunity to destroy the thing so thoroughly that there would be nothing left for her to take. Moving on, down more corridors, we came to a room with something glinting inside. We sent my undead in first to look, and suddenly some of my zombies and skeletons vanished, replaced by a drow, a minotaur, and some other shadowy figure. It was a mirror. I shouted at the others not to look in it, guessing at what had happened to part of my army. Then the newcomers attacked. The drow dropped a Cloudkill spell, and we all started choking and blacking out… until the figure in the shadows leapt out and punched him, dropping the spell. It was another tabaxi. The fight was quickly over, and we talked to her (though we covered the mirror first so none of us would look in there). Her name was Ninya, and she had come down here with an adventuring party as soon as she realised what was happening with resurrection magic. Her best friend was slowly dying, and Ninya was not going to let that happen. But all of her party had been killed already, and she got trapped in here. We offered her a place with us, and it turns out, she already has the soul of Shagambi! So our collection is now complete, with all nine gods. Fionn figured out that the mirror was a soul stealing mirror, but before trying to figure it out, we decided to rest, as we were fairly hurt. When I told Zagmira about losing Oz to the strange loop, she looked disgusted at me, and couldn’t believe that I didn’t have the right spell prepared to get him out of there. So we popped back up briefly and she dispelled the strange enchantment long enough for me to get Oz back. He was not very impressed with me, but at least he’s back. Fionn kept examining the mirror, and found that it had words for activation and/or release, we just needed to find them. Then Orvex realised there were two words in the back of Withers’ journal that we hadn’t gleaned the purpose of yet: ‘komarah’ and ‘blackfire’. So we tried these. We managed to free an ancient Omuan trapped inside the mirror. We struggled to communicate with him and calm him, until Hugo, with help from a chwinga, managed to soothe him. We managed to get my zombies and skeletons out, but also a few things we had to fight, like a troll, an invisible stalker, a gargoyle and a stirge. We also recovered Biff the Doppelganger, who had been travelling with the Yellow Banner. We took him and the Omuan up to a safer level, revisiting them to check they would be okay and have enough food every now and again. Fionn destroyed the mirror. We came to a door with a figure with a hand extended. The trick was to high-five the figure, and the door opened. Within was a section of corridor shaped like a figure eight, with one of the key-skull skeletons, this one being hexagonal. Also in the room was another door similar to the one we’d come in via, which made us suspicious, as they seemed the sort of doors that would slam shut. So we wedged furniture in the doors before exploring further. In the middle part of the figure eight was a pedestal with a magic black opal crown. Orvex managed to make out that it belonged to Archmage Sadimar of Netheryl, who had tried to destroy the world somehow. At the far end of the figure eight from where we entered was a jade devil’s face on the wall, mouth open into complete darkness. Words seemed to come out of that mouth, threatening doom and oblivion. I got a skeleton to stick an arm in, and the arm just vanished. We all left the room except Oz and a couple of skeletons, and I got them to try picking up the crown. The doors slammed shut, or at least tried to with the furniture stuck in them. Through Oz’s eyes I could see four ghostly forms emerge from the devil’s mouth, and kill the skeletons and Oz. They did not try and come for us though, and when I resummoned Oz and opened the doors again, the crown was where it had been. We decided to just leave it. Ninya showed us the room, or series of rooms on this level where she got Shagambi. It was an intense obstacle course, that Ninya showed us through at my insistence, with lava on the floor, and moments where we couldn’t breathe… but we got through, and saw a terracotta army – the one I guessed was spoken of in the riddle, so we walked past silently. We realised we had left something unfinished on his floor according to the riddle, something about the iron sceptre’s twin. After searching, we finally found it off of the room we found the sceptre in. There was a sun in the middle of the room smiling at us. When we covered it with a blanket, it frowned. Otherwise, it seemed harmless. Within the room was a sarcophagus, that said it held Nepaka, Nepartak’s grandmother. We opened it and found the twin sceptre. We took it, and it had inscribed on it that it was enchanted to destroy Nepaka (but oddly, not this Nepaka… weird). We also found a jade crocodile shaped key in a jewellery box. We made it to our goal in less than 24 hours over on our Kickstarter for Prince of Cats. Thanks so much to those of your who backed us and spread the word! This went beyond my wildest dreams. I really didn’t expect such a rush of excitement for the game. If you head on over there, you can check out the ideas we’re considering for stretch goals, and join in on our community play through of the game on Facebook. Prince of Cats – Now Live on Kickstarter… and a Project they Love!! Get in quick for the limited spaces for unique art of yourself and/or your cat. Or just get the game at a cheaper price than what it will be when it comes out. Also we are totally stoked to be featured as one of Kickstarter’s “Projects We Love”!